Here I am the same as before, but different in every way. wanting to be there for them every second, but knowing full well such things are impossible. I have to let go everyday. Every morning when I wake up and they are not there. Each time we get in the car headed South again. They inspire my every thought and they hold my dreams in their ever-growing hands, their smiles are like granted wishes and their laughs like answered prayers. How can I describe the place they have in my heart? because every situation is unique in and of itself. and none of that matters in the slightest to me. Their pictures hang in my office, our bedroom, all over the house; they are tucked in my wallet and always behind my lids as I rest. My sleep filled with hopes of the next time we meet or memories of the last time we saw each other. Every time they call to me, reach out to take my hand or we share a silent joke, I am born again. Reminded why I do any of what I do and why it is all worth the effort and pain. It is not their reaction that matters, what is important is that every second we have together I try my best. absolutely sure of their station in my life. We are bound by their father, but we have found a common ground apart from him- not that he is apart from us, only we are not dependent on him to hold us to one another. We build what we can with the time we have, we do not fret when we part, only hope for more time in the future. Years pass like minutes, flying ever closer to the unsure future. I try not to be greedy, but I can’t stop wishing for more of their time. this is what it means to me to be a stepmom. to hold them up and let them shine. 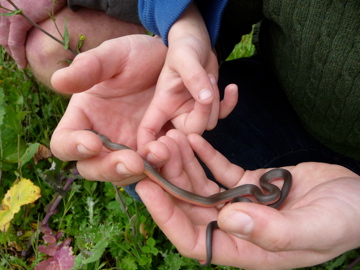 We all like to find snakes, what’s not to like?! Reblogged this on Wicked Rural Homestead.